Whoops! Maybe you were looking for Freemasons, or Money? How about NWO, or Communism? Possibly even Stalking? Secrets. They're all around us. Secret conspiracies are everywhere. Conspiracy is an ancient pastime, and so is the study of conspiracy. Secrecy in itself is harmless, but it always seems to attract attention. Where can one find truth? Only in Illuminati, the game. There is an international version of the game where you can instead control the Catholic Church, Israel and the IMF. Begin by putting all of your money directly on the table. Half of each player's money goes into the middle of the table. This is the pot. A player may stack their money in a neat pile, or spread the bills out in front of them to flaunt their wealth. Gameplay will go quicker if each player counts their income before the game starts, and a designated banker keeps track of each person's individual worth and opens an untraceable bank account in the Cayman Islands. 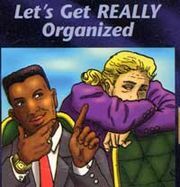 The power structure of Illuminati is centered around the Illuminati card - much like a credit card. 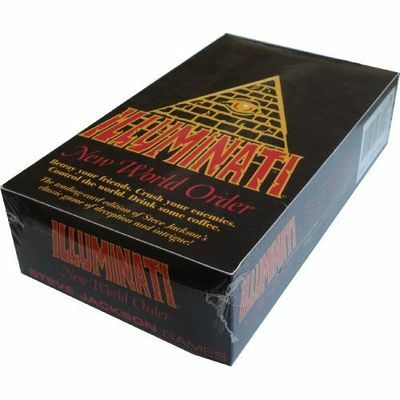 Each player starts with one of the eight Illuminati cards. Each card is different and has its own special abilities. The "power number" on each card is a measure of its ability to dominate other cards. The higher the number, the greater the power. A card with a low number cannot attack on their own, but they can attack with the help of other cards. A card with a high number (like the Mafia card) is very powerful and can attack on its own. 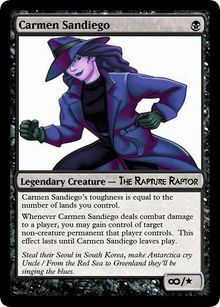 At first glance it may look like the Carmen Sandiego card only has a power number of 8, but that is just an optical illusion and was done on purpose. The Carmen Sandiego card actually has infinite power. Illuminati money is measured in Mega Bucks (MB). At the beginning of your turn, each card you have collected entitles you to the royalties listed on the card. This income is placed directly in front of you, becoming part of the Group treasury. If a card has no royalties, you collect no money. Two cards are designated a special income. The IRS card entitles its owner to 2 MB tax from each of the other players, rather than from the pot. The Post Office card costs its owner 1 MB per turn to own. Example: If your card 6 attacks card 2, you can succeed only on a roll of 4 or less. If card 10 attacked that same 2, you would succeed on an 8 or less, giving you a much better chance. Bitcoins are just a mere fraction compared to Mega Bucks. A player may, as an action, transfer any of their money to another player – either as master or puppet. A player may make two money transfers as part of their turn. Money transfers may be for the trade of cards, or for personal favors as negotiated by the players at time of gameplay. Trading cards is called a Change of Alliance. Cards may only be transferred if it is the turn of one of the players involved. You may give a card away (even if you get nothing in return), sell or trade it. Each card exchanged counts as one action for the player whose turn it is, and you may only give a card away with the permission of the player who receives it. Conspiring for a shared victory may seem easier than grabbing the whole pie, but be careful who you trust. There is almost always a way you can make your positions a little bit better and the other players' a little bit worse. Negotiate with everyone. Your foes are less likely to attack you if they think you might make a deal that will help them win. To avoid being attacked, you should look strong enough to defend yourself, but not so strong that you are a threat. Literally every single thing in this image is deliberate. There are many ways to assemble a power structure from the cards you control. Some ways are better than others. Take care that your power structure is balanced. Protecting the cards which you control is vitally important – you stand to lose greatly if one is taken from you in an attack. Your enemies will be continuously looking over your shoulder, counting cards. Watch them constantly; keep track of how close they are to winning. If they have powerful cards, they are more likely to be able to win in a single turn. Don’t count on other players to warn you this danger; they may have made a private deal! Some players think that Illuminati is more truthful when nothing – not even the bank – is sacred. Suggested methods for cheating include 'accidentally' misreading the dice or stealing from the pot - and if anyone leaves the table, anything goes! The game ends when one player controls all the cards or all the money. No player may simply “throw” the game to another by giving one person enough cards, money, etc. to let them win. This prohibition requires a certain amount of interpretation and honor among players. When two players agree to a deal, it is binding if they make the exchange immediately. A deal is not binding if it involves an exchange of one thing now for something in the future. In particular, it is perfectly legal to to try to change an opponent’s mind by promises or threats. Any agreement between players, secret or otherwise, is permitted as long as it does not actually violate these rules. Good luck gumshoe. You've already lost. This page was last edited on 6 June 2015, at 02:36.